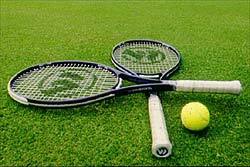 Are you into tennis and do you play tennis yourself? Do you consider yourself a good tennis player? Even the best tennis players in the world are still trying to improve their game. Do you want to improve your tennis skills and up your game? This is the How To Play Tennis instructional package and it guides you through progressions of developing the right tennis techniques (very easy to follow) with a series of step by step video's. (easy to follow tennis tutorials). This package contains 16 video's. Forehand Tennis Lesson (8 videos) & Backhand Tennis Lesson(8 videos). This package contains 10 video's. Serve Tennis Lesson (6 videos) & Return Tennis Lesson(4 videos). This package contains 11 video's. Volley Tennis Lesson (7 videos) & Overhead Tennis Lesson(4 videos). Each package also contains a Free Bonus of 5 video's (How We Learn Tennis). Selling price of each package: Only $17. If you decide to order all 3 packages today it won't cost you $51 but you will get all of these tennis tutorials packages for only $37. On top of that you'll also get the additional bonus video's package FOR FREE! Is this the deal you we're waiting for or what?